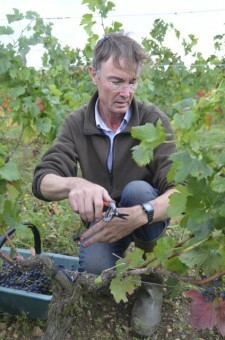 Also published on JancisRobinson.com and Livex. A complicated year, a complicated harvest. After a fraught growing season in 2013 (see my pre-harvest report for a detailed overview), most Bordeaux chateaux and vignerons have had to bring in their Merlots rather sooner than planned, before the dreaded rot sets in. Some Cabernets are following in quick succession (as at Lafite-Rothschild in Pauillac, below) but now that the sun has come out, there’s a ray of hope for those that can hold on for a little while longer. 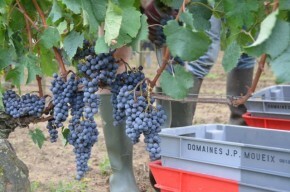 It’s all a far cry from the à la carte harvests of 2009 and 2010, when you could pick and choose at leisure. ’Une année compliquée’ is a polite way of describing 2013 and can be used by owners and managers without giving their public relations people a headache. It’s really code for a bit of a shocker. The weather at the end of September and for the first days of October proved, unfortunately, to be ideal for the development of botrytis – otherwise known as rot. Sultry heat and too much rain over the weekend of 27-29 September was perfect for the champignons in the bunches to thrive and forced growers on both banks to be extra vigilant and, for most, to take swift action. 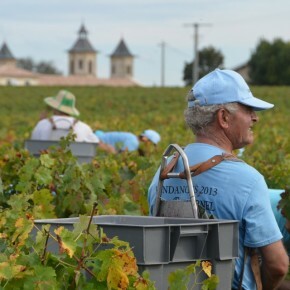 In many cases they’ve had to harvest red grapes long before they had had a chance to ripen, and only the tiniest estates in places like Pomerol can bring in everything at the same time. Out in the vineyards, it’s been all mud-clogged wellies, short sleeved shirts and waterproofs. Until this week that is, with the welcome boost of chilly, bright mornings and warm sun in the afternoon. Last week, in the clammy, sweaty conditions with hardly a breath of wind, you could see the rot spreading in some parcels – notably on the thin-skinned Merlot – within a horribly short time. A small percentage of rot on the bunches (as in the Merlot in Margaux, right) could explode to 50% rot or more in just a few days. But it was not all bad news, as some vineyards – indeed, some rows within the same plot – coped far better than others. What’s made the difference is complicated: the precise timing of the late flowering in June (heavy rain mixed with some sun), the extensive work in the vines (such as de-leafing, removal of shoots or crop thinning at the right moment), the terroir (notably the soils and sub-soils), the choice of grass or ploughing between the rows, the effectiveness of anti-botrytis treatments (the most important spraying against rot occurs towards the end of the flowering), exposure to any breeze before the harvest and a host of other factors could all have made a small but crucial difference. Even the most ambitious and resourceful chateaux, however, could not hold back the effects of the humidity for long. What was more unusual – and this was down to the threat of the botrytis spreading – was to see so many chateaux in St-Emilion and up-and-down the Médoc harvesting at the same time as the more precocious terroirs. That rarely happens. 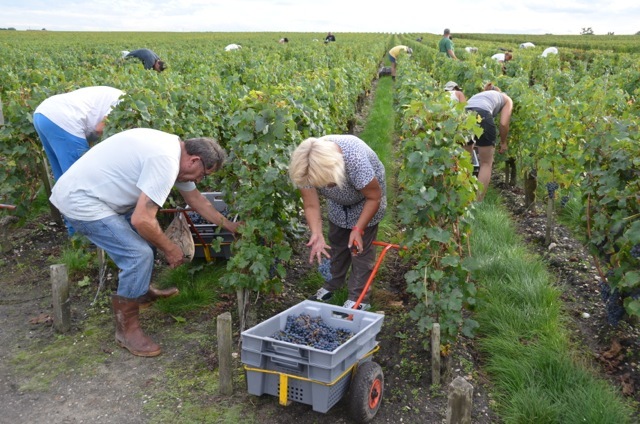 Teams of pickers for the crus classés (the team at Cos d’Estournel, pictured top right, was 80-strong) worked like ants alongside the towering machines in less prestigious sites nearby. 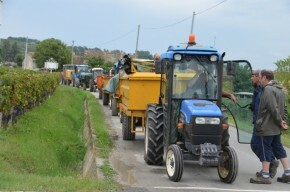 The queue of tractors and trailors (pictured below) outside the co-op in St-Emilion stretched way back, and it was the same story in the so called ’lesser’ appellations. Consultant oenologists were being rushed off their feet. Then, just as it seemed that the vineyards which had survived the rain and humidity from the last weekend of September could try and hold out, more rain came on Thursday 3 and early Saturday 5 October. This second burst of rain has proved too much for some plots that have been on the edge of rot, forcing chateaux to pick, even on Sunday. 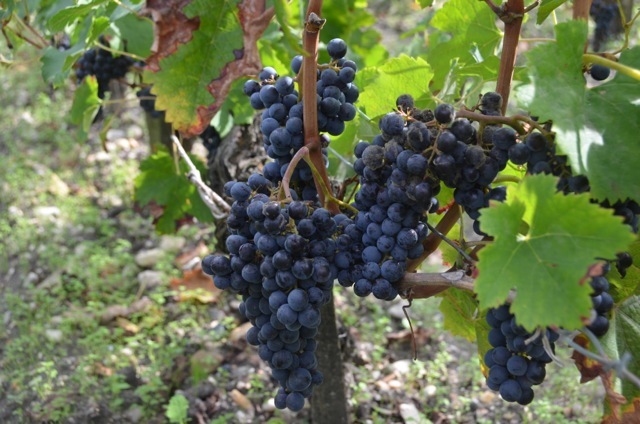 This week, the skies are clear and the sun is shining, so some of the later-ripening vineyards and varieties (especially some Cabernet Sauvignon, the mainstay of estates such as Mouton-Rothschild, right) could profit. If the rot holds off. I’ll report back as the harvest draws to a close.